Science Fiction, in generic terms, can be said to concern itself with marvels, technological inventions, and projections of human, post-human, or alien pasts and futures – whether the exploration of such occurs in the pages of literature, or on the cinema screen. Historically, its literature has seen wider experimentation, and richer harvests than its celluloid cousin, and prior to the release of Stanley Kubrick’s 2001: A Space Odyssey (hereafter referred to as 2001), science fiction in film was typically a B-movie or exploitative affair. Many examples tended to appropriate tropes from the horror or western genres and, particularly in the 1950’s, played upon semiotic paradigms of the ‘atomic age’ and sleek, futuristic technologies (Clute, Nicholls 1995). With notable exceptions, science fiction films rarely challenged viewers on a serious metaphysical level. Memorable instances include Forbidden Planet (which allegorically explored Freudian notions of the id), Fahrenheit 451 (an indictment of totalitarianism and censorship), Alphaville, (science fiction through a film noir lens), and Fantastic Voyage, (a rumination on Cold War politics of the era, embedded in the science and metaphor of invasive bodies), to name a handful of proto-masterpieces of the genre. 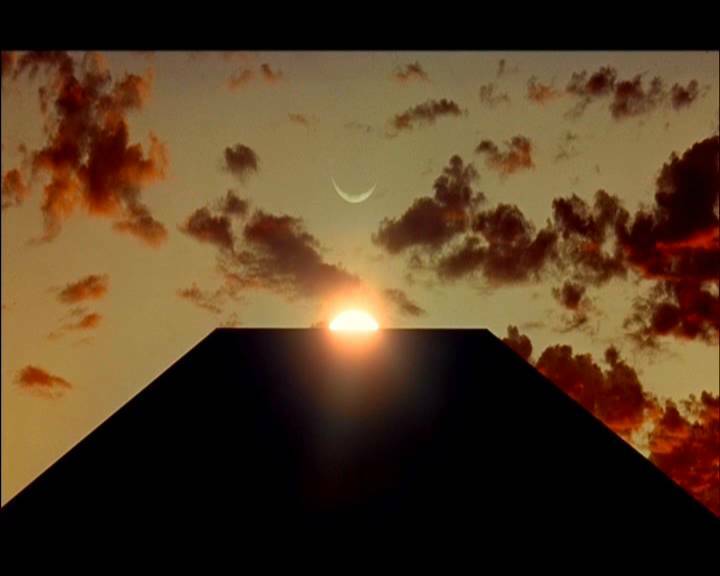 In 2001, however, Kubrick reached beyond the standard narrative conventions of science fiction films primarily through his use of music, the verisimilitude of his special effects, a thematic focus on the nature of existence, a measured compositional approach and editing, his de-emphasising of the verbal, and his explicit pitch for mythology (Gemlis, 1969). Undoubtedly, his partnership with Arthur C Clarke in the co-creation of film and novels interpretations of 2001 yielded rich insights. Clarke’s novel has a majesty of its own, yet is a more conventionally told tale. It is in film, and its captured light, that the story of 2001 exists in its elemental sense. Whittingen comments, ‘from a cultural perspective, the science fiction contract between spectator and film accepts and encourages the blur of realism and artifice as a convention’ (Whittengen, 1997). In an instance of the apparently unique quality of the science fiction visual imagination, married to film, the subsequent influence of 2001 on the US space program tantalises us with a winking proof of Baudrillard’s assertion that ‘images precede the real to the extent that they invert the causal and logical order of the real and its reproduction’ (Baudrillard, 1987). The ‘realism’ of 2001‘s special effects (accomplished with the help of NASA engineers) makes the fantastical notion of space travel mundane, industrial, procedural and hostile – only for Kubrick to later explode that realism as Bowman enters the Star Gate near Jupiter, where the then-new slit-scan camera technology generates a bewildering, dissociative experience that the viewer shares with Bowman. Bowman’s experience of the Star Gate – for those who haven’t seen it, a vision of geometric and cosmic velocity experienced by astronaut Dave Bowman in orbit of Jupiter, after encountering the higher intelligence behind Man’s evolution – evokes McLuhan’s observation that ‘(m)yth is contraction or implosion of any process’ (McLuhan, 1964). In comparing the effects of 2001 to the later Star Wars, Dan Rubey notes that while the latter’s effects are ‘classier’ and ‘more sophisticated’ in representing three-dimensional movement, Kubrick created ‘visual images of a different order of reality… to force his audiences to participate in the disorientation of the characters in the film’ so as to induce ‘feelings of otherness, other spaces, other kinds of experiences’ (Rubey, 1978). This is as true of the lucid landscape shots of the early prehistoric sequences, as it is of the orbiting space stations and weapons platforms that dance around Earth to the strains of music’s ‘highest’ accomplishments. Whittengen cites Arthur C Clarke’s contention that 2001’s balance of realism and artifice ‘provides balance and context for the “metaphysical, philosophical, and religious” issues presented within the narrative’ (Clarke, in Whittengen 1997). Famously, the soundtrack for 2001 also broke from convention in that the music consists of classical scores such as Blue Danube and Also sprach Zarathustra; the latter alluding to the Nietzschean ideal of the superman and the film’s implicit message of apotheosis. Such music helped underline the cosmic sweep of images and the ponderous notion of weightlessness ‘so, through a peculiar logic, the space hardware moves slowly because it’s keeping the tempo of the waltz’ (Ebert, 1997). In addition, the use of diegetic sound such as the ambient environment of the interior craft spaces, breathing apparatus and the silence of space itself, particularly with the audio editing in the face-off between Bowman and HAL, compounds the dislocating nature of the experience of viewing while paradoxically generating a deeper immersion in the manner of suspense films. Therefore, says Ebert, ‘the film creates its effects essentially out of visuals and music’, a goal Kubrick maintained was intentional to ‘avoid intellectual verbalisation’ in order to directly reach ‘the viewer’s subconscious in a way that is essentially poetic and philosophic’ (Kubrick, in Gelmis 1969). Ebert acknowledged that 2001 ‘did not provide the clear narrative and easy entertainment cues the audience expected’, leading distinguished critic Pauline Kael to deride it as ‘a monumentally unimaginative movie’. (Kael, 1996). ‘(i)t is precisely when it appears most truthful, most faithful and most in conformity to reality that the image is most diabolical… it is in its resemblance, not only analogical but technological, that the image is most immoral and perverse’ (Baudrillard, 1987). However, in reaching towards the 21st century, Kubrick’s 2001 is almost a filmic capstone to the great, two hundred year project of modernity described above by Habermas (in Foster, 1983) where contrary to Baudrillard’s concerns art, science, morality and universal law meet and their cognitive potentials are most cogently and provocatively expressed. Baudrillard, J. (1987). The Evil Demon of Images, The Evil Demon of Images. Power Institute of Fine Arts, Sydney, pp. 13-34. Clute, J. & Nicholls, P. (1995). The Encyclopedia of Science Fiction, St. Martin’s Press. Gelmis, J. (1969). An Interview with Stanley Kubrick, from The Film Director as Superstar, Doubleday and Co., New York. Habermas, J. (1983). Modernity – An Incomplete Project, in Foster, H (Ed. ), The anti-aesthetic : essays on postmodern culture, Bay Press, Port Townsend, Wash, pp. 3-15. Kael, P. (1996). For Keeps: 30 Years at the Movies, Plume. McLuhan, M. (1964). Media Hot and Cold, in Understanding Media: the Extensions of Man, Routledge and Kegan Paul, London, pp. 22-32. Walker, A. (1973). Stanley Kubrick Directs, Abacus/Sphere Books Ltd, London.